With all the furore over carbon footprint this and green that, it's interesting to learn that recycling isn't necessarily the best option when disposing of your PC. 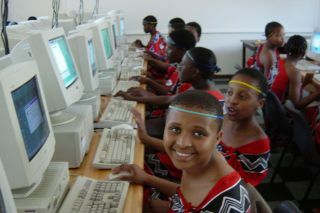 One alternative that the charity Computer Aid provides is reuse, which involves sending old hardware to less economically developed nations. Computer Aid founder, Tony Roberts, explains the process. How are you involved in Computer Aid? I founded the organisation 10 years ago and was the chief-executive until a few months ago. I'm now director of development, which allows me to spend much more time really focused on the ground in Africa developing new projects and programmes. Chile is also one country in Latin America where we already have a large program where we've supplied 13,000 computers. You receive about 3,000 donations a month from companies, educational establishments and individuals. How are these processed? The first task is the data destruction. We use Blancco, which overwrites every sector of the hard drive to a level that is certified by the MoD and GCHQ. Then there's the diagnostics process of testing all components for faults and specifications. If parts are defective, they're binned and the working hardware is used to build a new machine. By the month's end we may have 3,000 donated computers, but only those working and with a high specification are selected, which equates to about 2,000. Are the costs involved in refurbishing a PC substantial? It costs about £39 a PC and then the outlay for shipping overseas, which depends on bulk and location. Shipping a full container is the most cost effective at about £8-£10 pounds per PC. But if a single PC went to Burkina Faso, it would cost £39 to refurbish, but upwards of £300 to ship. Price also depends on how regular vessels are to their destination. What are your thoughts concerning the current trend of cheap laptops? We welcome any initiative that provides affordable computing to schools and not-for-profits in developing countries –that's why we exist. Computer Aid is in no position to meet global demand on its own. We're doing research into low power PCs, which would benefit rural locations with unreliable or no mains electricity. Solar power is an option as it's cheap once running, but capital costs are expensive. Powering a computer lab of 25 requires 25 panels, which is out of the question. Instead, we conducted some research on reducing the power used by a computer by 90%, which would enable 10 PCs to be powered by a single solar panel. This includes the use of the OLPC, Intel Classmate, Asus Eee and thin client systems. We are taking those shortlisted to three universities in Africa to find one that works in real life circumstances. Have you found that these low cost PCs are reducing the amount that you are shipping? No they're still increasing. Those PCs are not yet generally available; you can't buy an OLPC in African retail. You have to deal directly with OLPC and order millions at a time primarily for schools. But as Computer Aid donates not just to schools, it would not for an OLPC. The Waste Electrical and Electronic Equipment (WEEE) directive has created stumbling blocks for the process of reuse. How is the WEEE directive affecting the machines provided to you? We haven't noticed a significant difference since the legislation passed. I think that is because the WEEE directive is very clear in recommending reuse rather than recycling. But in the last few weeks of the consultation process, the wording was watered down. Although there's a recommendation, no targets were set and there is no policing. We do not believe that the legislation has had the desired result of increasing reuse. If you try telephoning the Government you'll be unable to find who's responsible for implementing and monitoring the directive. We're now starting to regroup and relobby to update and modify that legislation to give it teeth and police. So it is not just a recommendation, but results in an increase of reuse rather than recycling, which is very positive for the environment. Research has been undertaken that empirically proves that reuse is 20 times better for the environment than recycling. This was carried out by the United Nations at the UN University in Tokyo by Eric Williams and Ruediger Kuehr. All their research is published in Computers and the Environment: Understanding and Managing their Impacts. Ruediger is heading up a UN agency that's looking at reuse and recycling computers in Africa.